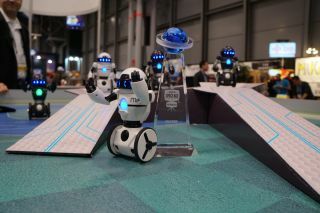 WowWee's MiP balancing robot won the top prize in the Amazing Robot Space Age Award category at Toy Fair 2014. WowWee will also present at Toy Fair 2015. Toys for space fans young and old will be revealed this weekend. Thousands of people will descend upon New York City for Toy Fair 2015 from Saturday (Feb. 14) to Tuesday (Feb. 17), to present new toys and gadgets of all kinds set to hit the market in the next year at the Jacob K. Javits Convention Center in Manhattan. Hundred of toy manufacturers — including Hasbro, WowWee and LEGO — will be in attendance at the four-day conference. "The 112th annual North American International Toy Fair®, the largest toy and youth product marketplace in the Western Hemisphere, is expected to bring together more than 1,000 exhibiting manufacturers, distributors, importers and sales agents to showcase 150,000+ products to nearly 10,000 buyers representing 7,000+ unique retail outlets in 100 countries," Toy Fair representatives wrote on the conference website. Toy Fair is not open to the public, and no one under 18 is allowed to attend. Each year, Space.com hands out prizes for the best toys that fit into our Space Age Awards categories. This year, those categories are: Best High-Tech Toy, Sci-Fi on Earth, Amazing Robots, Cosmic Space, Flying Drones, Little Scientists, Retro Future and Do-it-Yourself Science. In 2014, toys from Crayola, LEGO, Laser Pegs and ThinkGeek won some of Space.com's top prizes. Other toys that won last year included WowWee's MiP balancing robot and a set of science kits from Thames & Kosmos. Check back with Space.com throughout Toy Fair to find out who the lucky 2015 winners will be. The 2015 winners will be announced online by Feb. 17. Editor's Note: Space.com's Calla Cofield, Miriam Kramer and Tariq Malik will be on the hunt for the best cosmic toys, and you can follow them on social media — at @callacofield, @mirikramer and @tariqjmalik — for the best photos and news from Toy Fair 2015 as it unfolds.